We are the leading manufacturer and exporter of a wide range of guniting machines. 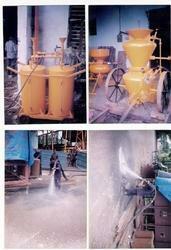 These machines are used for the purpose of mixing dry cement, sand and water under air pressure at high velocity. Our guniting machines consist of a twin chamber gun & water tank and are powered by an air motor. We are committed towards our clients and provide customization as per their requirements. Guniting or shotcreting is the process of conveying desire mixer of dry cement, sand and / or aggregate under air pressure at high velocity with just sufficient quantity of water for hydration. MTF make gunite consists of a twin chamber gun and a twin water tank and is powered by an air motor. The material is deposited on the desired surface through a placing nozzle under compressed air. These machines can also be used for sand blasting work by fitting on a sand blasting nozzle.